Easter Cross Scroll Saw Pattern. 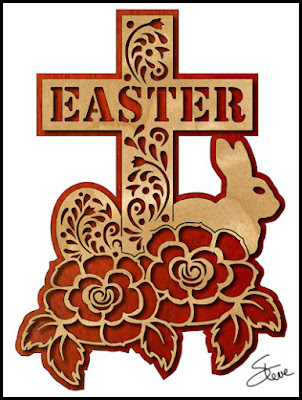 This decorative Easter cross is a little over ten inches tall. I did a write-up a couple days ago about choosing scroll saw blades. I expected to receive several comments and I did. There was a lot of great feedback and I thought I would share one in particular from John. Several valuable thoughts in his write-up. I read with interest your discussion about blade choice today. This subject is always at the top of the list with new members and new Scrollers at a Carolina Scrollers club meeting. I personally, when starting as a new scroller, bought many different blade types only to have the majority gather dust once I understood my preferences. Like most new scrollers, we were/are self-learners. I believe most Scrollers gravitate to their favorite type designs they like to scroll and some choose a multitude of designs. For me, I love to scroll detailed Fretwork. My favorites are clocks, especially those designed by Pedro of Spain. For relaxation, I like making numerous type bowls. And thirdly, Christmas ornaments because of our club’s focus program of selling and donating 100% of sales to the North Carolina Second Harvest Food Bank. I have two saws; Dewalt and Excalibur. I tend to defer to the Excalibur because I can “neutralize” the aggressiveness of the blade easier as this is important to me when doing detailed Fretwork. 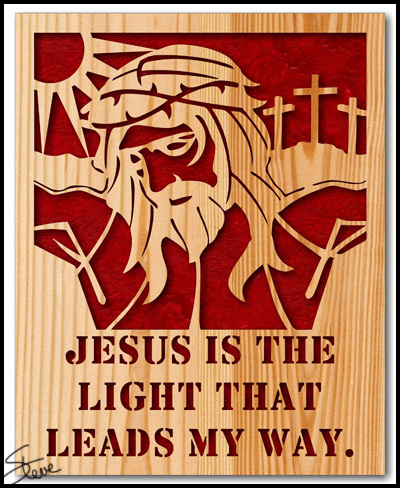 • Blade choices are individual and charts that are available should be considered as guidance and not “gospel”. • Although most saws operate fundamentally the same, there are differences that can affect blade choices. • Obviously, blade manufacturers say their blades are the best. However, the level of scroller’s experience and their adherence to basic steps have a huge impact on a scroller’s satisfaction with any blade. • Another big difference is “Need for Speed”. If a scroller is a production type they will want to cut fast and their selected designs will generally be less difficult or less intricate than a scroller that is cutting a family heirloom. In this case, the production scroller may choose a #3 or #5. For the “heirloom, the choices may be a 2/0 or a #1. • I indicated above I like to make bowls. My objective has been to make bowls, when complete, that have the same finish as a detailed clock. This means to me using a #1 to minimize entry hole size, smooth edge surfaces and tightness on compression fit bowls. All this with no regards to time to make. For a production scroller, time is important so cut-out time is a factor. As such they may go to a #3 or higher. These choices will affect the quality of the end product. • Another factor of blade satisfaction is the persistence of the scroller relative to follow certain basic steps; saw speed, pre-tensioning new blades, maintaining correct tension, removing blade manufacturing “burrs” and swapping out blades when the blade becomes dull. Couple these factors with the impact of wood choices and condition. (Flatness, hardness and wood thickness for design, ie too thick, too thin. • Another huge factor is when you analyze steps and choices if you are cutting Intarsia. Cutting hardwood 3/4 inch to 4/4 thick woods is significant compared to intricate 1/8, 1/4 or 1/2 thicknesses. • Spiral blades is yet another discussion. All said, is it any wonder why blade selection and use is the number one topic by the majority of Scrollers (and clubs)? The Carolina Scrollers club in Winston Salem meets each month. Our most important meeting segment is the Show & Tell. Members presenting are asked to discuss blade usage, challenges making their work and the finishing process. Periodically members will present a “how to” segment or demonstration on a given subject. Fifteen days left and we are almost at 8,000 entries for the giveaway. The gift certificates this month are really nice so make sure you get your entries in. Don't leave free money on the table. 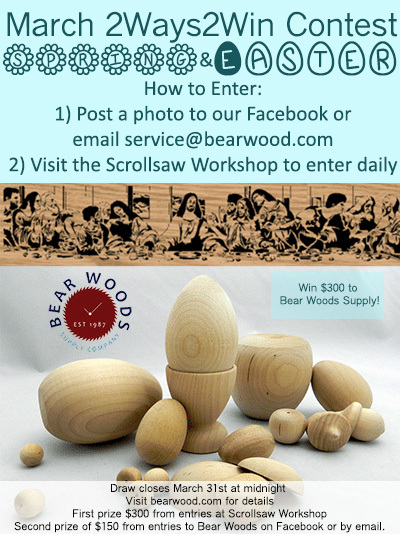 You can enter once per day. Winners are drawn randomly so you have just a good of a chance to win as the next person. 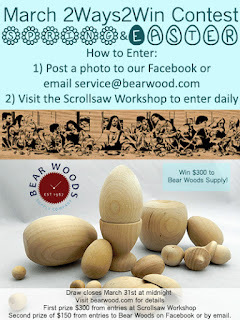 I am putting up $300 for gift certificate number one and Bear Woods is putting up $150 for gift certificate number 2. Go get yourself some free money. Winner randomly is drawn from all eligible entries. It's Spring and that means it's time for Spring cleaning. 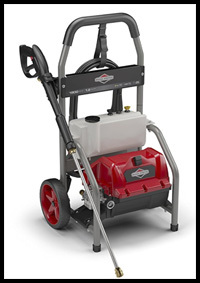 A power washer will make the job faster and easier. 8" X 10" Easter pattern. Let's talk about printing my patterns. Unfortunately it's a little complicated. My patterns are saved in PDF format(Portable Document Format). This format was invented by Adobe several years ago for distributing documents digitally. It's a great format with lots of baggage. In recent years the companies who produce browsers. (Edge, Chrome Firefox etc.) 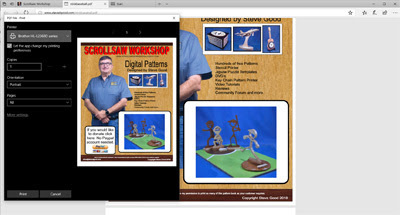 have built PDF viewers into the browser. That is fine for basic reading and printing but it leaves out some advanced features you may want. Pattern opened in Microsoft Edge browser. When you open one of my patterns in Microsoft Edge and select print to are given a few basic options. One feature you are not given is to print (Actual Size). This can sometimes cause the print to be smaller than designed. For some patterns that is a problem. To solve this problem you want to have Adobe Acrobat installed and set up as the default PDF application in your browser. 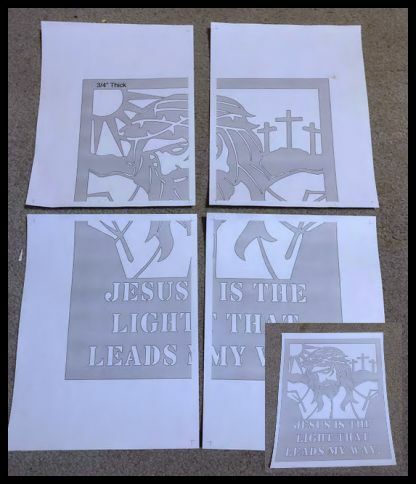 In the image above I have one of my patterns ready to print. Notice that I am give the option to print (Actual Size). 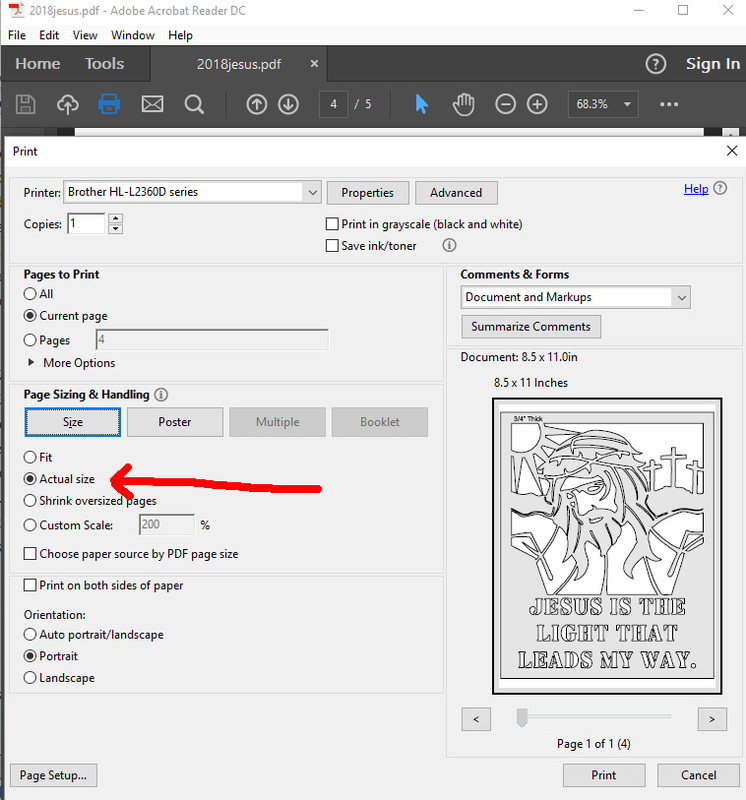 Another option built into Acrobat's print driver is (Poster Print). 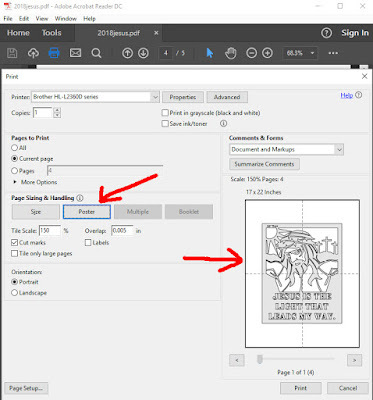 This allows you to set the scale of the print and stretch the print over multiple pages. This is great if you want to cut the pattern larger than designed. In the image below I have printed the pattern at 150%. 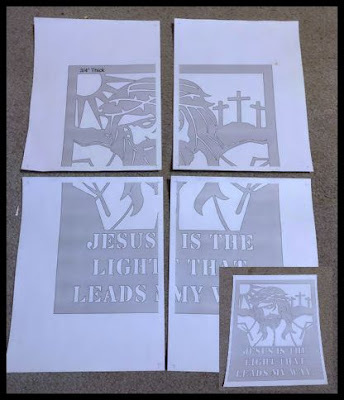 I can now cut and reassemble the paper pattern and have it ready to cut. How do I fix this mess? You have to install Adobe Acrobat(Make sure you uncheck the Optional Offers) if not already installed. It usually is already installed but just not set as the default app to open the PDF in a browser. Next you have to tell your browser to use Acrobat to open PDF files and not use the built in viewer. Each browser has a different way to do this but it is in the advanced settings for most browsers. The easiest way to get instructions is to do a google search for your browser. 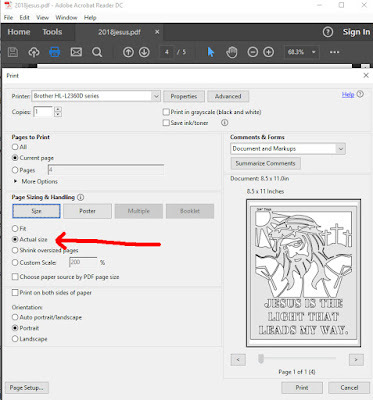 Example"how to make edge open pdf in acrobat". I know this is complicated if you are not computer savvy. 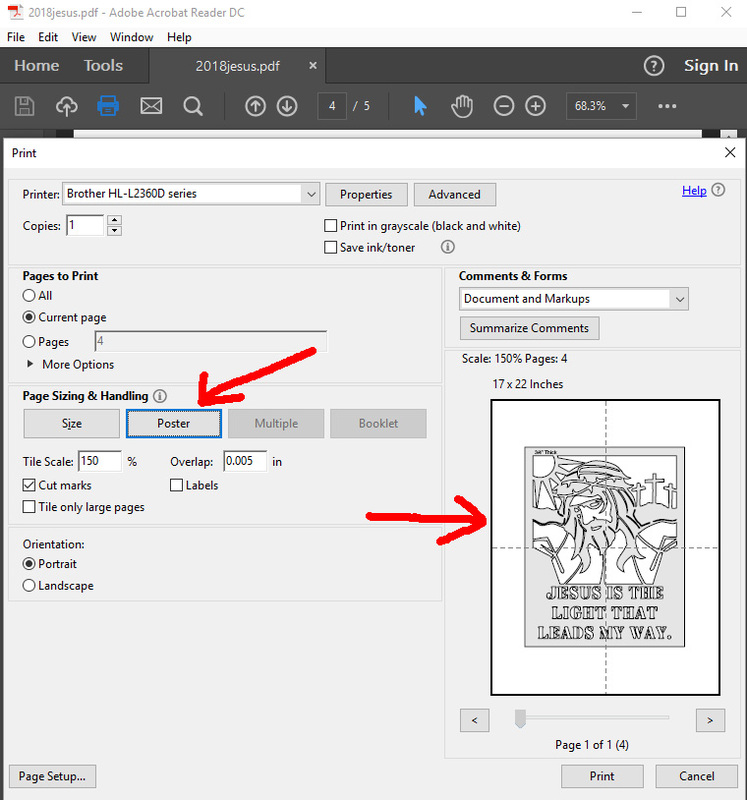 It is worth making these changes if you want these extra features for printing patterns. I purchased the Wen air filtration system back in December. I did a video talking about the unit. I had an email last week from a reader who wanted to know if I still like the unit after using it for a while. I thought I would give an update. The first note is that the price has gone up since I purchased mine. I paid $111.00 in December and the current price on Amazon is $126.38. This is typical of Amazon. You can often see large changes in price from one month to the next. Most of the time the price is reasonable compared to other online and local sellers. I am a Prime member so I get free shipping which always helps. How well does it work? I can only give an opinion here because I have not done testing with a dust meter. 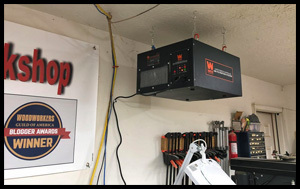 When I enter my shop I turn the Wen system on and set it to 400 CFM. I have made this a habit and turn it on even if I'm not sure I will be cutting wood. The unit is quiet enough that I don't mind having it on all the time. When I leave the shop I set the timer so the unit will turn off later. I usually set it to two hours. If I have been creating lot's of dust I set the timer longer. To get an idea of how well it's working I check the pre-filter often. What I find is that the pre-filter is coated with very fine dust particles. That's a good thing because these fine particles are what float around in the air and we inhale. These air filtration systems are not dust collectors. They are designed to help keep the air in the shop healthier to breath. I am considering purchasing a second unit for the other end of the shop just for added filtration. I want to get an air quality meter first so I can see what the numbers actually are. Do I see a difference in the amount of dust that settles on surfaces in the shop? I think the answer is yes but it's almost impossible to answer that accurately. I know the filter in the Wen unit has lots of dust in it so that dust did not make it back into the shop. I still have to blow the dust out of the shop every couple of weeks. My goal with this unit is to help keep dust out of my lungs. One problem that made me consider upgrading to this unit was a mild cough I would have after making projects. The cough would usually last a day or two. With some exotic woods like Bubinga it was much worse. As a subjective opinion I feel like the Wen air filtration unit is doing it's job. This is based on a few non measured observations. 1. My cough is noticeably lessened after installing the unit. 2. My glasses do not get coated with the small dust particles as quickly with the unit running. 3. The filter has lot's of fine dust in it. It's doing something. When I get the chance to get an air quality meter I will do a review based on measured results. That's the only way to say with any confidence what the actual effect of this unit is. Until then I can only give you my best guess. Winner randomly drawn from all eligible entries.